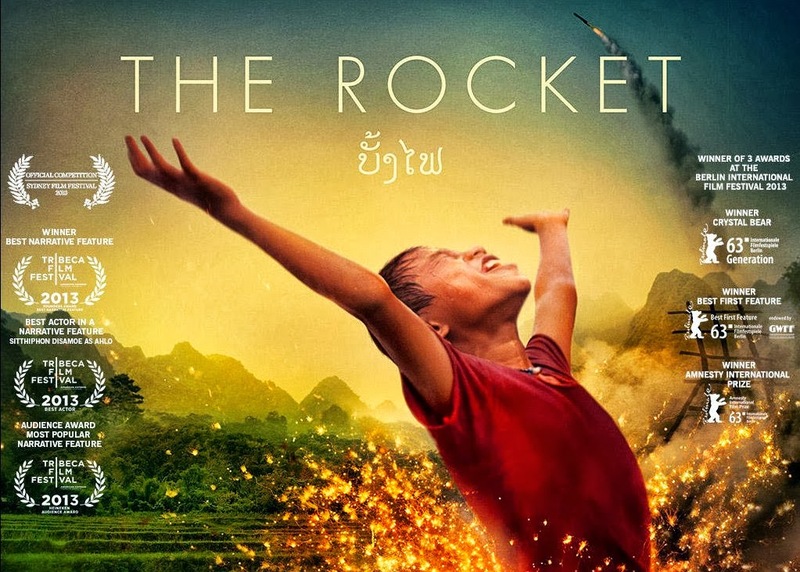 Filmed entirely in Laos, “The Rocket” seemed like an interesting choice for Australia’s recent Oscar submission for Best Foreign Language Film. It wasn’t selected, but it nevertheless earned some positive reviews and notoriety in various festivals since last spring and proves that not every country will produce a film that takes place on their own turf. I knew nothing of that last aspect before viewing “The Rocket” (although it is quite interesting), only that it was about a boy in a far off land, might involve a rocket and is currently playing at the Music Box Theatre here in Chicago. The film opens with a birth that takes place by candlelight in a tent. Mali (Alice Keohavong), a young Laotian woman has delivered a healthy baby boy with the assistance of her cantankerous mother-in-law, Taitok (Bunsri Yindi). Then comes more pain and it is discovered that there is another baby, a twin. We learn that the Laotian custom is to dispose of the twin, since the fable is that one will be a blessing and one will be a curse. Despite the grandmother’s disapproval, Mali decides to keep the baby, but it comes out stillborn. Ten years later, we meet Ahlo (Sitthiphon Disamoe), a vivacious and resourceful boy, affectionately looked after by his mother, Mali and his distant-yet-present father, Toma (Sumrit Warin). He doesn’t know he had a twin, no one does except Mali and Taitok. Life will soon change for Ahlo and his family once an Australian company arrives stating that a dam will be built where the live, resulting in their village being flooded. They are promised their relocation will include housing projects with running water and electricity. Taitok is convinced it’s all Ahlo’s fault and when sudden tragedy strikes their family during migration, the old woman discloses the secret in a harsh and heartbreaking manner. Although Ahlo feels the accusations, the boy remains confident and resilient even when he and his family experience one less-than-situation after another. They are placed in what seems like an internment camp with other displaced villagers with the promise that its temporary while their housing is finished being built. It’s there that Ahlo meets the James Brown-obsessed Uncle Purple (played by popular Thai comedian, Suthep Po-ngam), who is looking after Kia (Loungnam Kaosainam) an independent girl Ahlo’s age. Uncle Purple (earning his nickname because all he wears is a purple suit) is dismissed as a drunk and treated like an outcast by the rest of the villagers, but he eventually becomes something of a surrogate family member for Ahlo. The two families combine and journey together through war-torn country, searching for a place they can make home. They travel to Uncle Purple’s old village in the back of a truck filled with undetonated bombs driven by amputees and eventually happen upon an exclusive village that is holding its annual rocket festival. The goal is to “poke the gods in the arse” in order to stimulate rain and the one who makes the best rocket will earn a sum ranging in the millions. 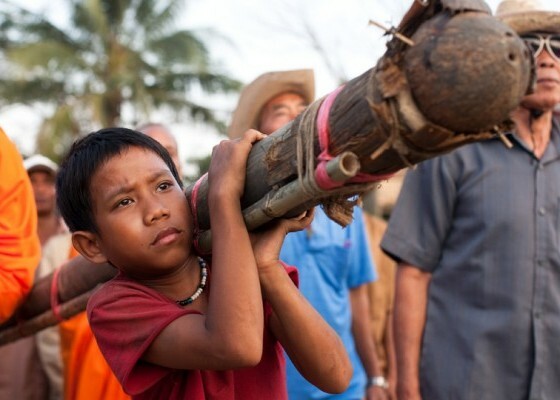 Ahlo becomes determined to build his own rocket and motivates his father to do the same. With the help of Uncle Purple, who provides unconventional advice on creating explosives (from this time working with American soldiers), Ahlo enters his rocket in the contest, determined and faithful that he will win money for his family to improve their way of life and, in turn, reverse this supposed curse that has been thrust upon him all his life. 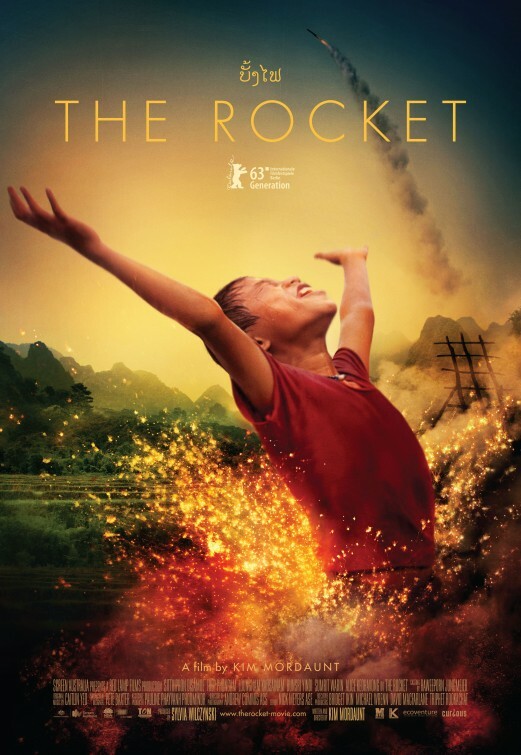 “The Rocket” is a modern-day tale that reminds us that there are people in other parts of the world living without electricity, clean water, food resources and steady jobs. It unfolds like a fable, with the main characters enduring insurmountable odds as our protagonist remains upbeat and playful while dealing with guilt and grief. The film may consist of conventional characters, such as flawed adults and undeniably sweet and charismatic children, but regardless, it’s an absorbing film. It’s almost impossible not to be shocked by certain events, delighted by the light moments of joy and moved by heartbreaking scenes of vulnerability. Mordaunt captures the picturesque Laos countryside with its immense mountains and dense green fields, almost making it a character in and of itself. But it’s the two young children who play Ahlo and Kia who run away with the movie. The two grow together, starting out as contentious-yet-playful peers to a relationship that is understandably something akin to close siblings. Their performances are natural and inspiring, complimenting the adults around them and making their work even better. Certain scenes in “The Rocket” may come across as manipulative or cheesy, especially the end competition, but so much has befallen these characters that you just want something to go right for them. The common thread of resilience and determination throughout the film is a reminder that no matter what anyone says, it’s still possible to make steps to create your own future.